Kerinci is a relatively new and still developing coffee area in Sumatra. The Kerinci Valley is surrounded by Mount Kerinci, the Kerinci Highlands and the lush forests of Kerinci Seblat National Park. The park’s 5,235 square miles of rainforest, volcanoes, mountains, wetlands and rivers are a boon to agriculture in the area, which 7 million people rely on. The area is also a UNESCO World Heritage site, with more tigers than in all of Nepal, Vietnam, Cambodia, Laos and China combined! 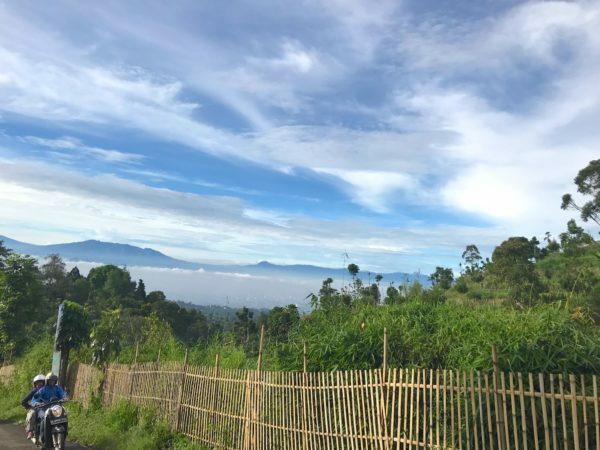 AgroTropic, founded by conservation expert Pak Suki Anto, has its Sungai Lintang Coffee facility at the foot of Mount Kerinici. 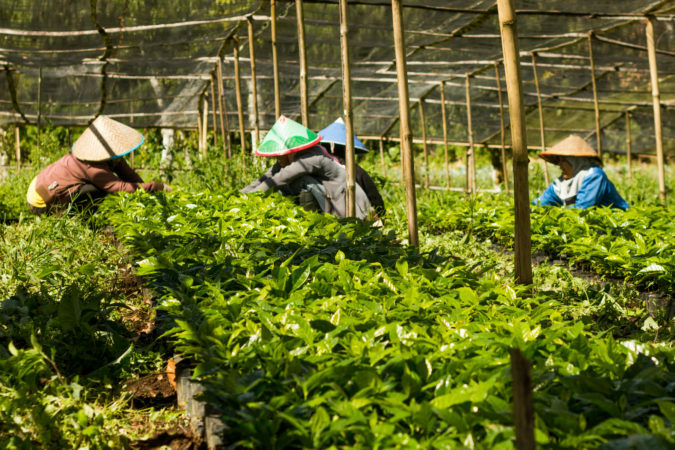 The group has been working with local farmers since 2009 and providing them with seedlings — it distributed 50,000 to 38 farmers initially and two years later distributed nearly 180,000 seedlings to nearly 800 local farmers, who intercrop the coffee with cinnamon, tea, potatoes and vegetables. AgroTropic agronomists also work with the farmers on planting, pruning, harvesting and composting techniques, as well as on “alley cropping,” which encourages the planting of coffee trees two spread-arms’ width apart, to allow in light and air. They also visit with the farmers at least once a month, to check in and help them keep standards high. AgroTropic also has the unusual practice of paying one flat, high rate for cherry, versus premiums for quality. While quality is prized, the single rate is meant to set a high standard and create stability for the farming families. When ripe cherries arrive at the Sungai Lintang facility, the crews start cleaning and pulping them and put the fresh, wet parchment into water fermentation tanks for a minimum of 12 hours. The parchment is then washed and sun-dried on patios, as well as in temperature- and humidity-controlled greenhouses with raised beds. Afterward, the beans are sorted first with a mechanical gravity separator and then a second time by hand. 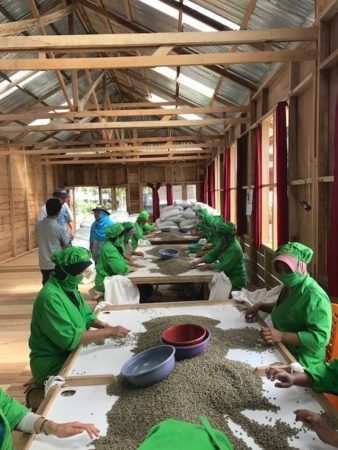 AgroTropic has a regular staff of 28 team members, two fermentation tanks capable of processing 20 metric tons of Arabica, and during the harvest season supports hundreds of seasonal workers. It also takes pride in the window-lined, light-filled buildings where the sorting takes place. It's a lovely work environment for 80 sorters, and an incredibly clean one — they don't even allow shoes in the hand-sorting room. AgroTropic also takes pride in its partnership database, which logs details about each farmer and his or her coffee. The system allows AgroTropic to monitor all payments made to the farmers, to run a credit program with their women partners and to trace every bean back to the farm where it was grown. In the future, AgroTropic plans to formalize its credit union and be a healthy cooperative.